I have focused on beverage labeling law since 1988. During that time it has been very rare for a private party to bring any action against a beer, wine or spirit supplier’s labeling or advertising — unless the basis was trademark. Instead, most people assumed the states, TTB, and FDA would take care of this, pretty much to the exclusion of anyone else. Pom began to unravel this in a big way over the past couple of years, and this trend seems to be gaining momentum. A San Diego law firm filed a class action lawsuit, on December 8, 2014, in federal court in California. The case is called Nowrouzi et. al. v. Maker’s Mark Distillery, Inc. A few pages of the complaint are here. If you want a copy of the whole complaint, or updates, they are available upon request and without obligation. The complaint goes right for Beam’s jugular (Jim Beam owns Maker’s Mark). 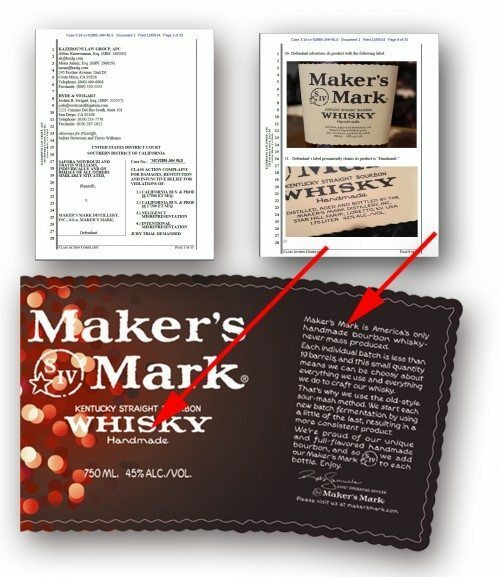 It essentially says Maker’s Mark is lying about whether the product is “handmade.” The first count is for false advertising. The second is for unfair competition and fraud. Next is negligent misrepresentation and then intentional misrepresentation. The lawsuit asks for a jury trial, punitive damages, an injunction, reimbursement to consumers, interest, and lawyer’s fees. An example of the labeling at issue is above, and here is a recent TTB approval therefore. Maker’s Mark is way out there, on a limb. Very similar to the Tito’s vodka controversy (as regards “Handcrafted”) the whisky label has “Handmade” right out there, front and center. Maker’s Mark, though, doubles down and declares it is “America’s only handmade bourbon. …” That may be too extravagant to be maintained, and is certainly a big, provocative statement. Not least, it has indeed provoked a few lawyers in San Diego. Producing consumer goods by means of mechanized or automated process has long [been] touted as a cheaper way to “mass produce” consumer goods. By utilizing machines to produce goods, manufacturers are able to make more goods in a shorter period of time at a lower cost. Mechanization of course sacrifices quality, as machines cannot exercise the skill and care of a human craftsman. Every consumer would undoubtedly prefer a higher quality product, however many are not able or willing to pay for such quality. The demand for higher quality products has always existed amongst consumers and thus manufacturers market their products to those seeking higher quality goods and demand a premium price for that quality. As a great distiller once explained to me, “artisanal” is not always a compliment. When it comes to cars, or computer chips, for example, I am pretty sure I would rather have one made by a modern robot than a genial old man. I don’t really have a dog in this fight as of this writing. I do think this has reached a critical mass such that TTB should step in and seek to define terms of this nature, lest TTB be relegated to a role as a mere spectator in the gladiation of others. I do also think the term at issue is not quite puffery (such as “premium”) but not quite a factual statement, either (such as “aged 5 years”). The law probably needs to wake up and stop dealing with the easy cases, at one extreme or the other, only. As mentioned above, this case has a lot in common with the Tito’s vodka case. As to that case, it probably sounds like I have lined up on the other side from Tito in recent weeks. Not really. I started out with an open mind, recognizing the plaintiff’s may be mistaken, or Tito may be a wily coot who saw this coming and planned accordingly. But it has really been the hapless responses of the Tito’s supporters, in the weeks after the lawsuits flew, that colored my view. They made laughably inane arguments like, who cares about the labeling, or TTB said it’s fine. More recently, Tito’s lawyers filed a response, and it seems good, and much more persuasive than anything said on Tito’s behalf in the interim (as should probably be expected). I look forward to assessing the responses, in both cases, soon. We are a micro distillery and have been on the receiving end of one of Makers Mark cease and desist letters for a waxed seal. This really makes me giggle. I’m pretty sure that this is what the word Karma was made for.